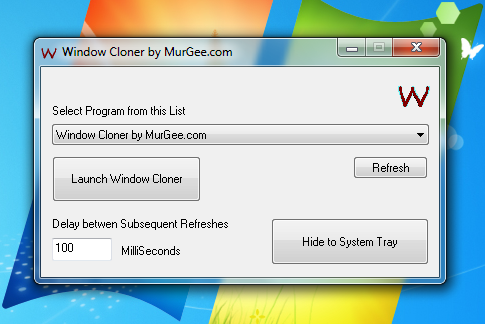 Duplicate any Window on your Windows 8, Windows 7, Vista and Windows XP computer using this Window Duplicator Software Utility. The Software presented is a small sophisticated and configurable software utility which can be used to duplicate any application or document window onto another resizeable window. This post presents Video tutorial of the software and presents screenshot of the software. Duplicating a Window can be really useful in many ways. The following paragraph outlines few example usages of the software application and presents screenshot of the software as well. Let’s say you are giving a presentation using a Projector connected to your Windows computer and you want your audience to see only one application and you do not want them to see your desktop or other applications, then this Window Duplicator software can come in really handy. In order to use this software and display only clone of a selected window on projector, you would need to connect the projector in extended mode and then you can create duplicate windows and drag them to the projector. As this software is useful when using extended mode, it also provides you the functionality of having different display resolutions for computer and projector. In case you simply use clone mode on a windows computer to display your desktop onto the projector, your whole desktop will be visible onto the projector and the display resolution of your computer monitor will be the same as that of the projector. In case your projector supports lower resolution than your monitor, the clone mode would force both computer and projector to display desktop and other applications in the minimum resolution supported. Connect a Projector to a Windows Computer or connecting another Monitor to the Windows computer is the same to the Windows. In case you do have a dual or multiple monitor windows computer, you can use the software presented in this post to create single or multiple duplicate windows and drag them to any monitor you want them to be. The Duplicate Windows have a configurable refresh rate and they are also resizeable windows. The Duplicate Windows do not transfer the Keyboard or Mouse Input to the actual application, however you can drag the duplicate windows by holding them with title bar or any other place in the duplicate window as well. Closing the application which is being duplicated will automatically close the duplicate window(s) created using the software utility. Watch a Video Tutorial or download the MurGeeMon software application to give it a try yourself. Yes this Window duplication software works on Windows 8, Windows 7 and other versions of Windows. The Software is offered on a shareware or try before buy basis. In case you would like to suggest a new functionality, please do write to the support team. This Window Duplicator automatically resizes the Duplicate Windows to the size of the actual window on startup. Once a Duplicate Window has been created, you can resize it by dragging it from the corners as for any other standard windows application or utility.